Beth must have psychic when she left the comment that it’s casserole and soup season! Maybe she just saw it coming, because I mentioned roasting a chicken and making broth earlier this week. Tonight came the inevitable soup. I was particularly happy with how it turned out. I think it started from the excellent fresh broth. I was a bit skimpy on the water when I made the broth, and I simmered it down a lot. That gave it a more powerful flavor. Then today, I got to use all kinds of fresh veggies. Carrots, celery, onion, of course, but also peppers, tomatoes, potatoes, and garlic. The noodles were red pepper from Ohio City Pasta. A little splash of hot sauce boosted the flavor, along with salt and pepper, parsley, and (one of my secret ingredients) dill. I don’t much care for dill, honestly, but just a pinch does something interesting in a soup, I think. Now I’m wishing I had thought to throw in some zucchini – we’re probably all putting it in everything we can this week, right? In the picture, you’ll notice the one down side of my small batch of broth – very chunky soup. When does it become a stew? I once heard Lynn Rosetto Kasper say that if you could eat it with a fork then it was a stew. This nearly qualified. In my opinion, though, it isn’t a stew unless you’ve thickened it with flour to make a gravy. So I’m sticking with calling it chicken soup. Or maybe I’ll just call it yummy. This entry was posted in General on September 14, 2011 by theneighborboys. I think you & I are on the same page, Tom, with our Fall/ Winter menus. To quote Kim’s favorite TV chef, Rachael Ray, she would say your dish is a STOUP!! Kim loves those cute play on words! Stew meets soup. Right, Kim? Your soup really does look tasty Tom. And, I would never have thought of putting Ohio City Pasta in a soup. I just put in regular egg noodles. I will be copying that idea too! Yes EVOO!! STOOPID!! I love em all. All it takes to get on TV is some buzz words and man hands and you are there! Just so you know, Kim does NOT care for Rachael Ray! That is why Bethy said that! Chicken soup has to be one of the best comfort foods on the planet! I remember one that Grandma Galizio made where she added those tiny meatballs and she put escarole in it. Or was that wedding soup with a lot of chicken in it? I don’t know why you say that I think Rachel Ray has some very nice cookbooks. I just can’t listen to her or watch her. OK maybe I am not a fan. Sorry. 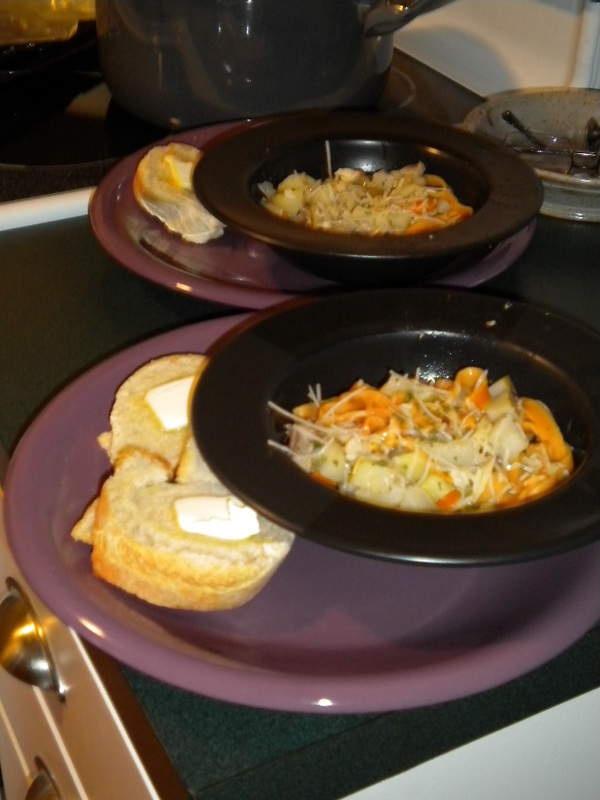 The soup was just Grandma Galizio’s soup it was always great and always a little different, and always wonderful. I remember that soup too Care. Everytime you walked in the door, you would just smell something wonderful cooking. Takes you right back!